Watercolor on Light Molding Paste (for Jodiiiiie)! Now THIS is cool! My pal Jodi at Life in Between and I were chatting the other day about how much fun acrylic texture materials can be……….and she encouraged me to experiment with Golden’s Light Molding Paste and watercolor paint. This may shock you (or not lol): I LOVED it! Next, I wet areas of the surface with water, and set in some of my favorite colors from my watercolor palette. Oh, the loveliness! This surface loves water media of all kinds! It is absorbent and yummy, like the best kind of watercolor paper, but with jazz and sass! I see limitless potential for FUN with light molding paste and watercolor, fluid acrylics, high flow acrylics, inks of all kinds…..think of an amusement park for color! Needless to say, I’m really excited about the possibilities for this surface for almost any type of abstract, and even cool landscape effects! I didn’t have time to make a real honest-to-goodness painting out of this last night, but this was loads of fun and I will definitely be playing with this some more. I understand that Golden’s absorbent ground is another promising surface for watercolor. And I’ll be trying that next! So anyway…..I need to pull myself down off the ceiling. I’m just so excited right now about the endless variety of artwork I can produce after trying this light molding paste. And I haven’t even tried most of the texture products from that set yet! I’ve been spending more time experimenting with all of the different paint formulations and colors! Chris Cozen’s videos on Artist Network TV – and her books – if you’re interested in playing with acrylics, she is a wonderful resource, and will teach you everything you want to know about Golden products. She is the reason I decided to even try acrylics at all, as I’ve always been a watercolor girl. She will show you what they can do! Her materials are the next best thing to trying the products for yourself. Dancing into the week, and I hope you all are dancing too! Happy Tuesday, everyone. Peace. < Summer Glow: Abstract Acrylic as May Madness Continues! Oh this sounds exciting! Your sample looks scrumptious…a delight for the eyes, and rather yummy looking too lol. Am looking forward to seeing what more you do with this and what you think of Golden’s Ground. I just picked up some Daniel Smith watercolor ground but have been a bit timid experimenting with it so I am really interested to see how you dive in to using something similar. You are such an inspiration and a joy to watch. Happy dancing! Peace. Thanks so much, Haunani! I’m so glad you can feel my excitement! I just heard about that DS ground too and would be curious what you think of it. Nothing like jumping in with both feet! I wonder how similar it is to this stuff. Does it come in a jar or a squeeze bottle? I assume it’s white? Is it moldable? Excitement is catching! I have not sat down and really played with the DS watercolor ground yet, but hope to this weekend. It comes in a jar and there are different colors available… Transparent, Buff Titanium, Mars Black and Titanium White. I have seen a bit of molding done with it by others, though not to the extent a molding paste would probably offer. Hopefully I will learn a bit more about using its properties soon, looking forward to play time ;D.
I’m looking forward to it too! Good for you, Haunani! Boy, couldn’t we all use more playtime in our lives? Thanks so much, Rebecca! Love the hare in your avatar! I had seen demos on this product but never actually worked with it. It was so cool! I always love art supplies of any kind, but this one made me feel just like a little kid! Best feeling in the world! Glad you enjoyed the info. Can you get Golden products there? I know DB ships internationally but I imagine you’d do much better getting it somewhere local to you. Yes we can get golden here, I only have a few mediums though, mainly I have liquidtex, as my local store stocks them over golden. Internet is great though, what would we do without it these days, learning and product choice. Isn’t that the truth? No doubt! oh pulllleeezzeee! we’ll see when I ever get to it. I’m going to be so confused! LOL! You won’t, honestly. Watch Chris Cozen on Artist Network! This is your mission, should you choose to accept it. She will blow your mind! Oh dear – and you got me to order – LOL! YIKES! It’s so beautiful. I’m in love with this, seriously! Next one I’m looking forward to trying is the clear tar gel. Oh I wanna try them all. Can you imagine if we were all retired and could do art whenever we wanted? We’d be doing murals in the sky lol! Oh this looks delicious and such beautiful results, I can feel your happiness! What happens next (while happy dancing)!? This is going to be fun! I’ve seen the texture/molding techniques before, and one day I’ll be ready to give them a try. Thanks for providing so much helpful information. The results you achieved are fantastic! Super tips, Laura, and your joy with your new art supplies and technique just jumps off the screen! 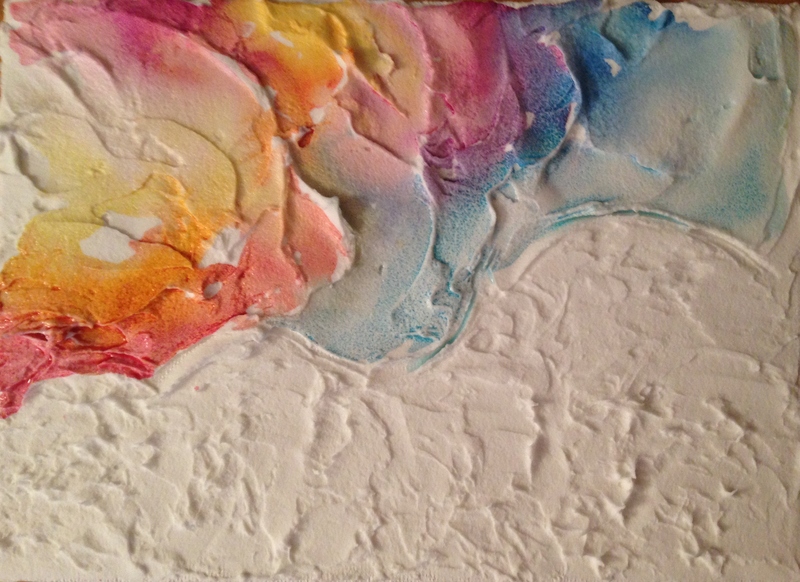 What fabulous texture and color effects you can create, as shown in your abstract. I totally could get into that, too! Thank you for the review and tips!!! You’re so welcome, Cynthia, and so glad you enjoyed this! Oh, still trying to pull myself down off the ceiling. The possibilities are truly endless with this! As much as I love art supplies of any kind at any time, this stuff is special because it made me feel just like a kid again. Best feeling ever! And it’s only just begun – bonus! Dying to see what you do with this stuff! Oh, it will be a while before I get into that. ; )) This painting I’m doing feels like it’s going take forever, lol! Heck yeah, it’d take me a lifetime! There’s always too many projects to contemplate but that’s what makes it fun! Hi Laura, what a terrific review on the Golden products. Your experiment is very inticing. I’ll be sure to put this product on my list to try. Have a beautiful day! Art supplies are so much fun!! Who doesn’t like to play with marshmallow cream? That does look fun! It looks like frosting on the cake! Right? And so much fun! Seriously, this stuff is cool. Glad you enjoyed it! That sounds like a lot of fun! Thank you for sharing your experience. It is a blast! And you are welcome, thanks for stopping by and commenting! Really glad you enjoyed it! The colors are lovely, and your excitement about the product is amazing! My son gave me a wine and paint gift for my birthday and it looks like the company uses acrylics. I’ll walk away with a 16×20 painting when done. I signed up for my first session in early July. It will be the first time I will use acrylics since middle school! I’m a bit anxious, and excited about it, but hope I learn something and like what I paint. What a terrific gift, Deborah! Sounds like a blast! Acrylics are so much fun, and I am really blown away every single time because I never expected to like them! If you think they may be for you, I can highly recommend the Golden starter set. I liked them at first but fell in love once I went with the Golden products. You will have so much fun, looking forward to hearing how it goes! I love how you are always ready to explore and have fun…..I love your painting! it looks “luscious”. So, are you saying that Golden is even better than the artist quality Liquitex? How are they different? When I first bought acrylics I bought the soft body artist quality Liquitex but wondering when I take up acrylics again, I might go with Golden. Sell me on them. I have purposely used them to almost being out because I was thinking of trying the ones that are slower to dry, I still haven’t decided. I think that they are called “open”? anyhoo…..fun post! Thanks, Margaret! Yes, it is Golden Open acrylics you are probably thinking of and they are great! They have a 1-2+ hour open time in my experience, longer depending on thickness and temperature. The Golden paints are very pure and creamy. I don’t believe they use any fillers. They are made in the USA and the company is employee-owned. The paints are luminous with light. They are a joy to work with! Soooo many different types of products, including texture mediums of all kinds, pumice gel, micaceous iron oxide, interference colors (which refract light, they are amazing all on their own), iridescent colors of all shades, fluorescents. They have everything! Best part for me is that when I order from Blick, I can return anything I don’t like, opened or not, no questions asked. So there is no risk! I can shop around and find the best price from the major suppliers and Blick will match it if you let them know in the delivery instructions when you place the online order, and include a link to the better price. I called one of their product specialists (et are artists) to ask what products I needed to buy to get me started with acrylics. Bottom line was the A to Z sets by Golden would give me small bottles of lots of different products that I could try and make up my own mind. Return if not liked! So I went with it. And I am so glad I did because I thought why go with the more expensive brand if other artist-quality brands are less? Having tried the Liquitex basics (which is not technically artist quality), and the Liquitex soft body and heavy body paint now, and comparing to the Golden – for me, there is no comparison. But you may not agree, this is just my .02. The great thing is if you’re curious, try and see, if not send it back! Can’t go wrong IMO. But I bet you fall in love. I know Debi loves the Golden products as well. And made in USA, not China?! Gotta love that. Worth paying a little more to keep more jobs here, I think. You’re right, if the Open paint is tacky then it’s drying. It’s smooth and luscious when wet. I’ve never painted with oils but I imagine it’s very similar to how oils feel going down. My Liquitex basics set was made in China. My artist quality Liquitex paints were made in France. Everything I have by Golden was made in USA. I do believe that’s your price difference. And Golden uses no filler. Acrylic polymer and pigment and that’s it. So a little goes a very long way and the paint is just dreamy. I’m returning my soft body Liquitex set (hardly used) that I bought last summer back to Blick. Oh, also, does the affiliate link lasts a long time…that is, I know with Amazon affiliate links, if you put it in your cart, you have only 24 hours (or some such short span) to pay for it or the affiliate won’t get credited for the sale. So, I was wondering if I put the paste from your link into my DB cart, will I need to check out right away or will it still credit you if I don’t check out for a month? Teresa, I’m still new at this and this is a great question. I will find out the answer. And I appreciate you wanting to make sure I get credit; that’s very sweet! I know that whenever I add something to a cart at Blick, it saves it for me. I’m always logged in there, and it just saves it. Not sure if you have an account setup with them or not, but I’m a frequent buyer, so I do lol. What you could do is save it in your cart and then when you’re ready to buy, just come back to my site on a computer and click on my black Blick button (wow say that three times fast) in my sidebar to the right. That’ll take you to Blick’s home page and you should be able to go to your cart at that point and the product should still be there. I will find that out from them though but I have to say … as much as I love Blick, I am not impressed with the company that handles their affiliate program for them. Cumbersome, hard to understand, not quick to respond to questions, etc. Anyway, thank you, and you will love this stuff! I bet your kids would too! I do have an account, but that doesn’t guarantee that you’ll get credited. You can save stuff in your Amazon cart forever but apparently (and I have no idea how they do it), the affiliate reward aspect gets stripped from the products somehow. That’s too bad that DB’s affiliate program company is not as good as DB itself. No, it doesn’t mean I’ll get the credit, Teresa, but at least you would know which item you wanted and it should be saved in your cart. Then when you’re ready to checkout, you would have to go back to my site and click on my black Blick button in the sidebar to start the process of actually buying it. Yeah, it is frustrating but they all can’t be winners like Blick! Thanks so much, Teresa, I really appreciate what you’re doing. That should also work. I have had people click my affiliate links and I’m not always getting credit for the order, too, unfortunately, which is one of the reasons I dislike the vendor they use. They are the industry leader, though, but something is awry. But not always awry, just occasionally. So when you place your order, if you could let me know, I’ll be able to confirm that it was linked to me, I would appreciate it. Until they get this straightened out, I need to look over their shoulder. The main thing is I hope you really enjoy the products and have fun with them because they are a blast! Thanks again! Looks like a whole lot of fun Laura! Thanks Jill, having a blast!! Have you tried any type of paint on molding paste? Hehe thanks! I get a little crazed when I have a few art supplies I’ve never used lol. What did you think of the acrylics on it? I’ve not tried that yet. I agree, this looks like fun Laura, love those juicy colors! Have you ever tried this with acrylics, Deb? Not tried the molding paste – just the joint compound 🙂 In fact I have 2 that are in the works (started last week) – we’ll see what happens! Do you mean the joint compound like at the hardware store? If so, I hope it works! What about archival properties. All good there? Sounds promising! Nice! Can’t wait to see!! This is quite simply… cool as hell! I love how adventurous you get with different media. And it always turns out so awesome! Love this😍… It creates such a wild and dimensional effect. Hmmm…. methinks I might need to try this someday! LOL yay Charlie!!! Do ittttttt!!! (I feel like I’m quoting you, how many times have you said the same thing to me hehe!) Dying to see what you do with it Charlie! Well and that little sketchbook works really well for you, you’re making amazing stuff with it. I think I am too art-ADD to stick to one medium. Maybe it’s because I’m new to art. I feel like a kid in the toy store, just bouncing from one aisle to the next, will I ever stop lol? I actually ‘prefer’ using the molding paste with watercolors vs acrylics. it transcends the effects to another level. I love it. Thank you, 3d, I will do it! Glad to hear that you prefer the watercolor with it. Since molding paste is a polymer medium (right? ), I kind of expected it to bead up and runoff. Still don’t really understand why it didn’t but I do love it! I’ll be curious how the acrylic ink and fluid pigments work with it also. Thanks for your feedback as always, Debi! Fantastic effects Laura, you could call it Nile River. Aw thanks Denis! I love that title! It does really look so yummy! I can’t wait to hear your coming adventures with the light molding paste. Oh have fun!!! Yes, I understand totally but what a great exercise in not giving up!! Looks like you had fun with it, like a kid in a candy shop 🙂 might have to give it a try one of these days. When I saw your project above, my knees went weak. I LOVE modeling/molding paste (spelling depends on the brand). I have have modeling paste that is white, black, and many metallics. I just took a class at Donna Downey’s studio and we got to use all the Golden Products! I was in heaven! My file folder journal pages on my blog were all created at Donna Downey’s class. We also got to play with pan pastels and oil pastels as well. Unfortunately, my pocketbook isn’t printing money at the moment. I know I don’t need open acrylics here because it is so humid. I love the thickness of heavy body paint, but I also love the high flow for other projects. Im going to eventually get some fluid acrylics and airbrush medium so that I can make acrylic sprays. I have a lot of water based sprays and they will not go over acrylics. Love your work!!! Jade, you just made my day, my friend! Thank you! When you find that money printer, let me know lol! So glad you liked it, Donna! This is a product I’ll definitely be playing more with! Loving the texture products!